Bright xenon lights flare while space shuttle Atlantis rolls down a 3.4-mile stretch of river rocks, as the vehicle embarks on its historic final journey from the Vehicle Assembly Building to Launch Pad 39A at NASA's Kennedy Space Center in Florida, on May 31. With just one more mission remaining before the end of NASA’s storied 30-year space shuttle, the agency has shifted its focus to the final launch of Atlantis on July 8. But exactly how does NASA get a space shuttle ready to fly? Atlantis moved to its launch pad at Kennedy Space Center in Cape Canaveral, Fla., on May 31, with final preparations under way for its planned liftoff on July 8 at 11:40 a.m. EDT. The shuttle rolled out to the launch pad just hours before its sister ship, NASA’s shuttle Endeavour, landed early on June 1 to wrap up its own final mission: a 16-day delivery flight to the International Space Station. Atlantis’ final voyage will come less than six weeks after Endeavour’s return. The shuttle will fly one last 12-day trip to the space station to deliver vital supplies. The crew of STS-135, NASA's final mission for its space shuttle program, pose in front of their spacecraft, space shuttle Atlantis on May 17. From left to right are mission specialist Rex Walheim, commander Chris Ferguson, pilot Doug Hurley and mission specialist Sandra Magnus. 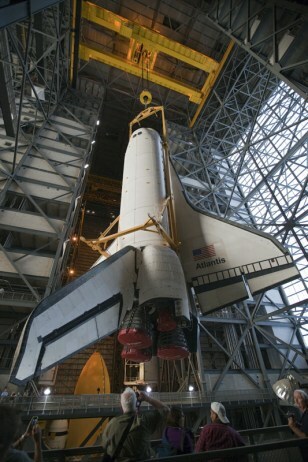 In the Vehicle Assembly Building at NASA's Kennedy Space Center in Florida, shuttle Atlantis is lifted by an overhead crane and moved into a high bay where it will be attached to its external fuel tank and solid rocket boosters, which are already on the mobile launcher platform. 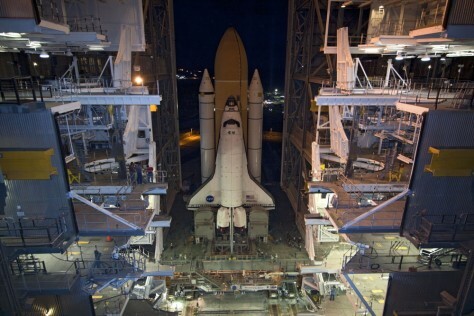 On May 17, Atlantis made the trip from its processing hangar at the Kennedy Space Center to the 52-story Vehicle Assembly Building (VAB), in a procedure that NASA calls "rollover." When Atlantis and its sister ships return home from space, ground teams perform inspections and maintenance on the shuttles in the Orbiter Processing Facility (OPF). Atlantis had been in the OPF since its most recent voyage – the STS-132 mission in May 2010. To get to the VAB, Atlantis traveled on a giant 18-wheel transporter platform. To mark the final shuttle missions, NASA has been inviting the thousands of workers who are part of the shuttle program to experience many of the major prelaunch milestones with their friends and families. During Atlantis' rollover, many NASA civil servants took photos alongside the orbiter they have worked on for decades. The four astronauts who will fly Atlantis on its STS-135 mission — commander Chris Ferguson, pilot Doug Hurley, and mission specialists Sandra Magnus and Rex Walheim — were also present to take part in the occasion. Inside the VAB, Atlantis was lifted and attached to its massive external fuel tank and two solid rocket boosters. Space shuttle Atlantis, attached to its external fuel tank and solid rocket boosters atop a mobile launcher platform, slowly inches out of the Vehicle Assembly Building for the final time, on May 31. The next phase in the prelaunch preparations involves moving Atlantis from the VAB to its seaside launch pad. This process is known in NASA parlance as "rollout." 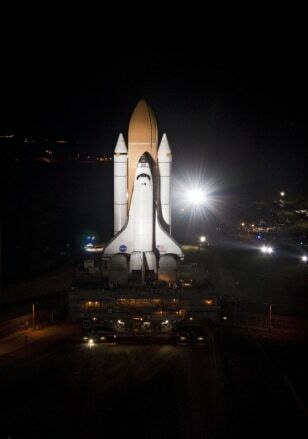 Atlantis began rolling to the pad just after 8:30 p.m. EDT on May 31, mere hours before Endeavour touched down at Kennedy Space Center's Shuttle Landing Facility. To make the 3.4-mile journey to Launch Pad 39A, the newly assembled shuttle sits atop NASA's Apollo-era crawler transporter and slowly and carefully inches to the pad. It typically takes about six hours for a shuttle to roll out to the launch pad. Brilliant xenon spotlights showered Atlantis in light as it rolled out of the VAB in front of record crowds. 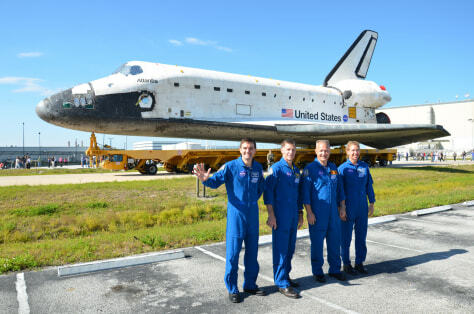 Atlantis' four astronauts were on hand at the event to address members of the media and enjoy the historic milestone. Shuttle program employees were once again invited to take part in the rollout, and NASA officials estimated that thousands of people showed up to mark the final time an orbiter makes its slow and majestic crawl to the pad. "We couldn't be more honored to be here and share it with them," pilot Doug Hurley told reporters during rollout, as Atlantis shone brightly behind him and his crewmates. "Obviously, the priority for us is to safely accomplish the STS-135 mission, but I think, almost as strong, is to just be able to share this experience with the folks who have worked on this vehicle for 30-plus years. We wouldn't be anywhere else but here tonight, so we're very honored to be here." The space shuttle Discovery stood on the launch pad at NASA's Kennedy Space Center as a tanking test began before its final flight. The wires in this image lead to some of the 89 strain gauges and thermocouples installed on the external tank for the test. With Atlantis now secured to its launch pad, ground teams performed what is called a "tanking test" on Wednesday, to make sure the shuttle's external tank is safe and robust to fly. 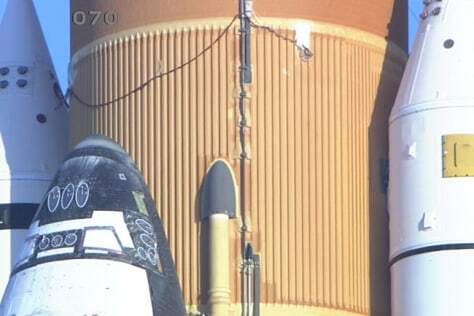 NASA decided to perform the test due to issues that were detected on the shuttle Discovery's external tank, which delayed the STS-133 mission for several months. Repairs and modifications were eventually made to Discovery's tank, and when the shuttle launched in late February, the external tank performed flawlessly, NASA officials said. Since Atlantis' external tank was constructed with the same materials and was manufactured during the same processing flow, engineers pre-emptively modified the tank the same way they did with Discovery's. The tanking test on June 15 will allow ground teams to collect data and assess how these modifications will hold up for launch. "It's very straight-forward," said launch director Mike Leinbach. "We fill it up, send the final inspection team out to the pad, they'll do their walk-down ... and then we'll get the 'go' for drain. That's it." A week's worth of X-ray photography will follow to assure that the metal struts withstood the extreme temperatures generated by 500,000 gallons of liquid oxygen and liquid hydrogen inside the tank. Engineers will take X-ray scans of the orbiter-facing side of a section called the intertank, which is the part of the external tank that caused troubles in the lead up to Discovery's launch. This provides detailed information about how the tank performs during the fueling process, and the data will help NASA officials assess the health of the modifications that were made to the intertank. "We're going to go ahead and do the tanking test to prove to ourselves that nothing unexpected happened, all our models are right, and we do understand how this (modification) performs," Mike Moses, chairman of the shuttle's mission management team, said in a news briefing on June 1. "The X-rays are really that double check to show we understand the stresses that got put into the system. Obviously we'll look at the data and if we're not happy with what we see, we'll take the next course of action. It really is that safety check of that Band-Aid that we put on the tank." Space shuttle Endeavour's STS-134 crew members poses for a photo on the Shuttle Landing Facility at NASA's Kennedy Space Center in Florida after arriving on March 29 to begin final launch training ahead of its last liftoff. During the week of June 20, Ferguson, Hurley, Magnus and Walheim traveled from NASA's Johnson Space Center in Houston to Kennedy Space Center in Florida for the Terminal Countdown Demonstration Test (TCDT). This two-day event, which started June 23, acts as a practice run-through of the countdown and launch and is also the time when the astronauts receive emergency training at the Florida spaceport. This launch day practice run is the last major training exercise for the astronauts before their scheduled liftoff. In addition to countdown preparations and emergency training, the crew members also participate in a variety of media events during TCDT. The commander and pilot typically also have opportunities to practice landings at the Shuttle Landing Facility. The astronauts fly a modified Gulfstream aircraft that simulates the shuttle's approach and landing. For their emergency training, the crew reviews procedures for the launch tower escape system, which is a 1,200-foot-long "slidewire" that whisks the astronauts away from any danger at the pad. The crew members slide down in baskets to an emergency evacuation bunker nearby. During TCDT, the astronauts don their pressurized launch and entry suits and perform a complete run-through of activities on launch day to prepare themselves for the real thing. Once all these other milestones are met, the STS-135 mission is primed for its Flight Readiness Review (FRR). There are two different FRR meetings – one among shuttle program managers, and then a separate executive-level meeting with top NASA officials. In these meetings, program managers, flight directors, mission managers and other top agency officials will discuss any issues that may have come up with the orbiter or its component parts, and assess the readiness of the vehicle and ground teams for launch. The shuttle program FRR is scheduled to take place on June 21. After Atlantis' executive-level FRR on June 28, NASA will call a press briefing and announce the official STS-135 launch date and time. 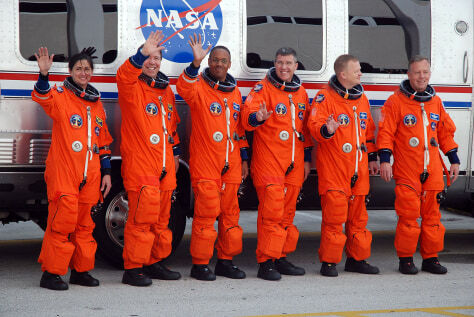 The space shuttle Discovery's final crew, the six astronauts of NASA's STS-133 mission, head to Launch Pad 39A at the Kennedy Space Center in Florida for launch on Feb. 24. NASA is currently targeting a July 8 launch for Atlantis' STS-135 mission, but an official launch date and time will be announced following the Flight Readiness Review. Once the launch date is set, the next major milestone is when the crew arrives at Kennedy Space Center for their scheduled liftoff. The astronauts typically arrive at KSC four days ahead of their launch, but NASA is planning to observe the July 4th holiday weekend, said Leinbach. "The weekend of July 4th, we have all three days off, so we're looking forward to that holiday," Leinbach said. "We'll be working weekends leading up to that July 4th weekend holiday, but it's different crews on different weekend days, depending on what the tasks are, so we're not going to be stressing one particular group at all." 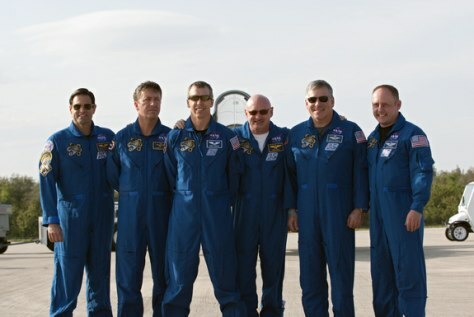 The astronauts fly from NASA's Johnson Space Center in Houston to their Florida launch site in the agency's T-38 jets. These white, supersonic jets are used by astronauts to maintain their aerial skills between missions. Upon their arrival at KSC, the astronauts begin their final preparations before launch and enter into medical quarantine to ensure that they are healthy for their upcoming mission. After that, the next major milestone that awaits them is their historic liftoff into history on Atlantis' final mission into space. © 2013 Space.com. All rights reserved. More from Space.com.